Real grammar takes a fresh approach to english grammar. real grammar gives you freedom to communicate effectively in english with clarity and confidence. Traditional grammar books tell you what people say. Real grammar explains why we say it. Learning why will allow you to truly Understand English. You will discover the core concepts of english and gain a deeper understanding of how english works. Once you Understand the simple connected core concepts of English, you can use them in a variety of situations to express a wide range of ideas. real grammar explores english grammar in a logical way, connecting what you learn with what you already know. As teachers, we want our students to use what they learn in class when they communicate in English. Knowing grammatical structures is one thing, but being able to use them in a natural way can prove challenging. The key is to get the student to Understand why. - Presenting grammar concepts clearly. - Comparing the new grammar concept to similar grammar concepts the student is already aware of. This helps the students Understand the similarities and differences, developing their ability to apply grammar in a way that communicates their thoughts clearly. - Expanding into uses in other situations. We present other contexts that a part of speech is used in, guiding the student to reason, come to their own conclusions, and discover why. 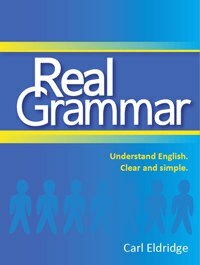 Real grammar includes explanations and practice activities that can be taught as grammar lessons or can be easily integrated into other english classes. التوقيت حسب جرينتش +1. الساعة الآن 01:25 AM.